He was no dragon, Dany thought, curiously calm. Fire cannot kill a dragon. Order your own copy of Mother of Dragons at your local retailer or online through our website today! Soon after the Mad King fell and in the wake of Robert’s Rebellion, the last two Targaryen children were forced to flee and hide in Essos. Now, King Robert is dead and the remaining lords and ladies of Westeros clamor to fill the space left behind on the Iron Throne. The time has come for the Targaryens to reclaim their birthright with fire and blood. 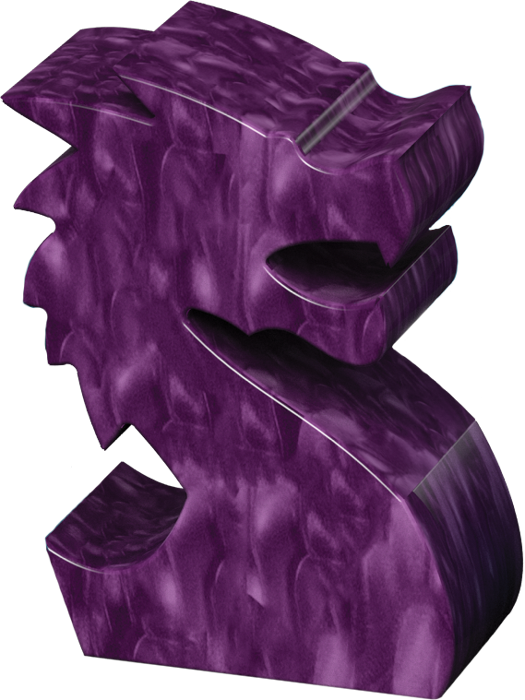 With every ally and tool at their disposal and the long-forgotten fire of dragons, they will claw their way across the Narrow Sea and bring Westeros to its knees. 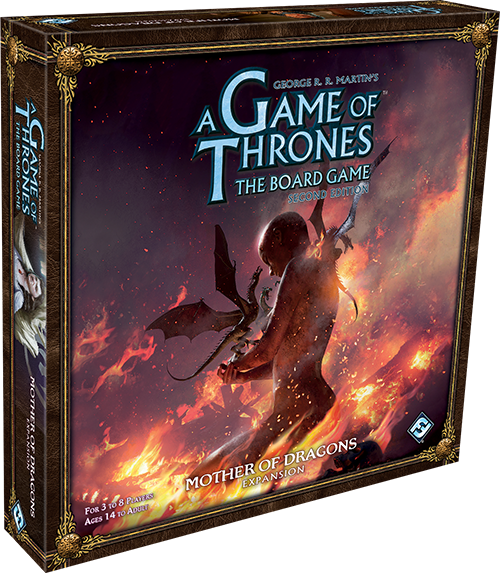 Fantasy Flight Games is proud to announce Mother of Dragons, a new expansion for A Game of Thrones: The Board Game, now available for pre-order at your local retailer or online through our website! The world of A Game of Thrones: The Board Game grows even larger with the addition of a brand-new sideboard, bringing the Free Cities of Essos to the fight for the Iron Throne. Here is where the reborn House Targaryen makes their stand, starting in the city of Pentos. Yet even though the Targaryens begin the game far from home, there are many in Westeros that wish for the once-great family to reclaim the Iron Throne. For now, they pledge false loyalty to the rulers in Westeros, but secretly, they wait for the day of the dragon to come again. The Essos sideboard from Mother of Dragons fits alongside the Westeros game board from A Game of Thrones: The Board Game. In the Mother of Dragons expansion for A Game of Thrones: The Board Game, House Targaryen has little need for castles and strongholds that are easily felled by dragonfire. Instead, their goal is to uncover the remaining Targaryen loyalists and rally them against the current holders of the Iron Throne. As such, House Targaryen does not earn victory points by capturing castles and strongholds. Instead, they track the number of territories loyal to their House—if they can claim seven of these on the victory track, they'll claim the Iron Throne and win the game! But the key power of House Targaryen comes in the form of Daenerys’s three dragons. Each of these magnificent creatures has an entirely new unit type. Unlike soldiers, whose loyalties can be bought, dragons cannot be mustered normally. There are only three dragons in existence, after all, and they remain in play from the beginning of the game until they are killed and leave the world permanently. Each of Dany’s dragons acts as a single land unit, attacking, defending, and obeying the same rules of supply. But unlike other military units, dragons have the ability to fly nearly anywhere in Essos or Westeros. What's more, dragons are alive, and they grow. As the game progresses, these beasts become stronger, growing from fledglings with a strength of zero at the start of the game to fearsome monsters with a strength of five by the time the battle for the throne finishes. With these creatures returning magic to the world of Westeros, who can deny the Targaryen’s divine right to rule? Not only does Mother of Dragons bring House Targaryen into the fray; this expansion also raises other familiar families to power by allowing you to play as House Arryn in any game of A Game of Thrones: The Board Game. With new character cards and an overlay of the Eyrie, your plots can take flight as you lead the once-insular forces of the Vale onto the battlefield. 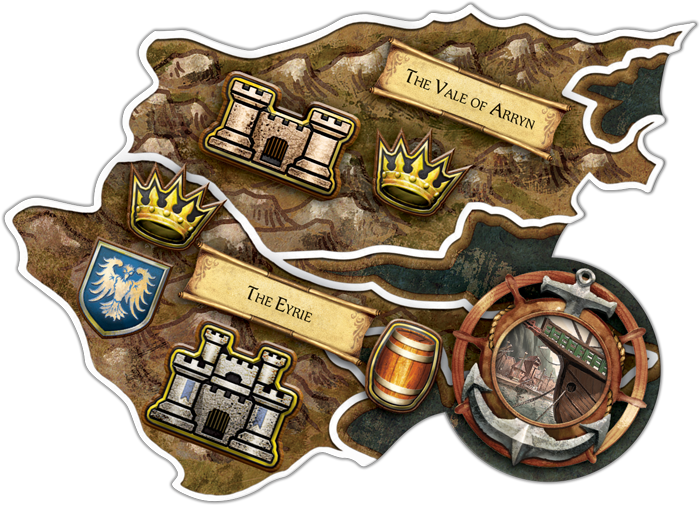 With these two new Houses and matching map pieces, you have the chance to dramatically elevate the chaos and intrigue of your campaigns by increasing the maximum number of players in the game of thrones to eight. 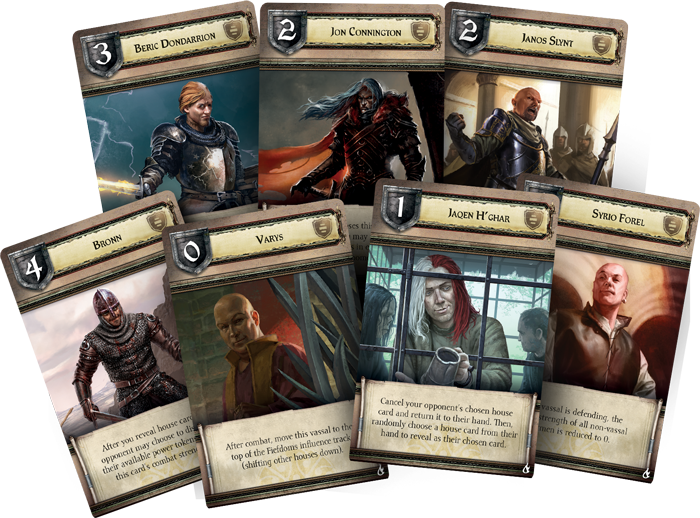 Beyond expanding the possibilities with more players, Mother of Dragons also makes it easier than ever to play with fewer players with the new vassal system, introducing unused Houses as neutral parties that each player can command and manipulate as an extension of their forces. 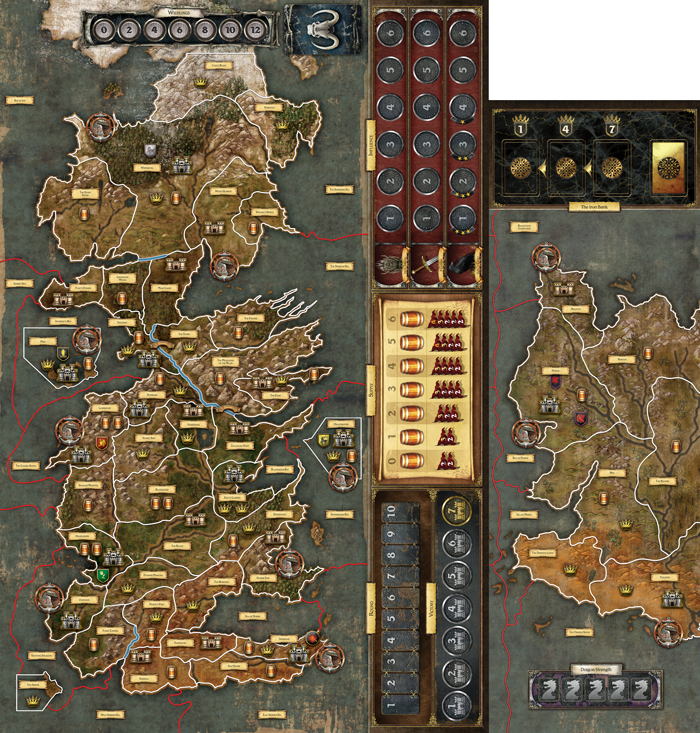 However, as none of these vassals are themselves vying for the Iron Throne, their loyalties can shift in an instant, with the vassal House each player commands changing from round to round. At the start of each round, the Houses competing for rule may choose their vassals, beginning with the most influential House on the Iron Throne track. Once the vassals have been claimed, the commanders may distribute orders to vassal units. However, while you may rely on the vassal's strength, you must be wary of these neutral forces whose loyalties are not as stalwart as your own. After all, in the next round, you could find your vassal house being used against you. When the vassals go to war, they also will not use standard House cards. Instead, they use a new set of Vassal House cards. Here, you will find iconic characters like Varys and Jaqen H’Ghar, whose loyalties are bound to forces beyond the ties of family lineage. 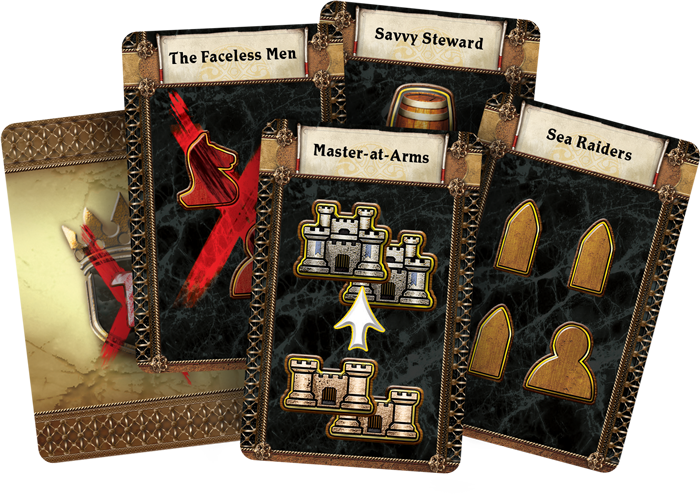 When you use a vassal to fight on your behalf, you will shuffle the vassal house cards and draw three from which to choose your card. Then, should your vassal win their combat, you may be rewarded for your deft leadership with a power token for your House. With a touch of tact, you can move closer to victory without even risking the lives of your own men! House Targaryen is not the only power that waits beyond the Narrow Sea. In the city of Braavos stands the Iron Bank, perhaps the most dangerous force in the world of A Song of Ice and Fire. Nestled in a seemingly impenetrable northern bay, the Iron Bank provides the lords and ladies of Westeros with favorable bank loans, allowing you and your rivals the chance to purchase powerful aid for your cause. To take a loan, you simply choose a loan from the Iron Bank display, and pay its initial cost with your power tokens. Once you have made your payment, the loan is yours and you may resolve its effects. This may mean purchasing sellswords, recruiting a skilled tradesman, or even hiring a Faceless Man! If none of the available loans catch your eye, you can simply wait until a more favorable (or affordable) option arises. 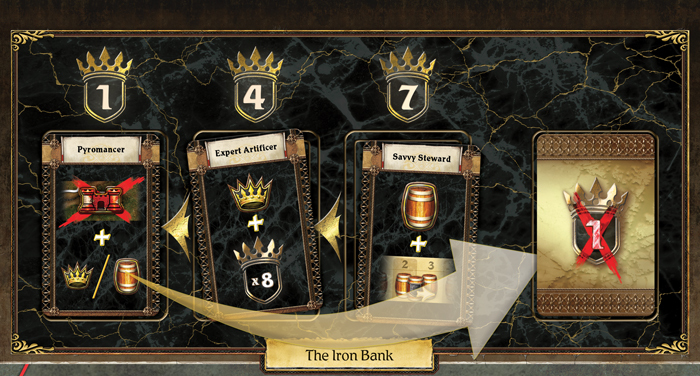 At the beginning of each round, the loan cards of the Iron Bank slide to the left, meaning that the longer a loan goes unclaimed, the lower its cost becomes. But be wary if you choose to do business with the Iron Bank. These shrewd moneylenders do not easily forgive debt and if you take a loan, you must pay an interest cost for the remainder of the game, discarding one power token for each loan you have purchased. And if you are ever unable to make your payments, the bank will turn to one of your opponents for recompense against you. All power comes with a price—what are you willing to pay? With the death of the usurper, the lords and ladies of Westeros have been too busy warring amongst themselves to notice the powers that gather in the East. The time has come for you to claim your birthright with fire and with blood. Cross the Narrow Sea and take back what is yours! Pre-order your copy of Mother of Dragons (VA103) at your local retailer today or on the Fantasy Flight Games website here!